Cook the beans in salted water, add sage, bay leaves and garlic. Finish to cook the beans on low heat to keep the water from boiling in order to prevent overcooking them. In the meanwhile, chop the onion, fry it gently in a pan with olive oil and add the tomato pulp. Add the beans with some cooking water and adjust with salt. Save some beans. Blend and seep through a strainer the remaining part and proceed to filter what you obtained. At this point, add the Maltagliati and let everything cook together until the pasta is ready. 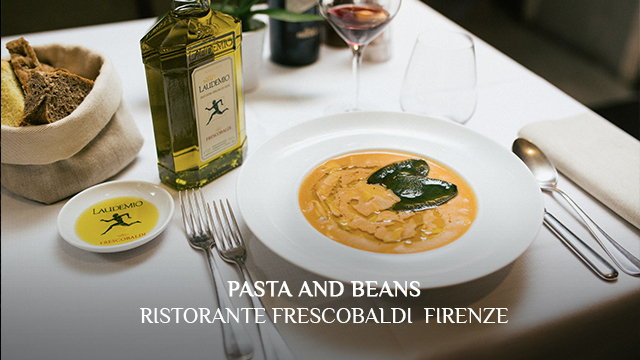 Serve with a sprig of rosemary, add the beans that you didn’t blend and a drizzle of Laudemio EVO.